Wickes is a chain of over 200 DIY and trade stores operating solely in the United Kingdom, now owned by Travis Perkins. The store group has grown rapidly in recent years, having taken over selected sites previously operated by the defunct Focus Do-It-All. Although Wickes sells a number of very well known brands including Dulux paints, Karcher washers and Makita power-tools, it is perhaps best known for it’s own brand products which are favoured by trade customers and sold under the tag-line ‘Wickes: It’s got our name on it’. Where can I check my Wickes Giftcard Balance online? You can check the balance of your Wickes Giftcard balance by visiting any of their stores. Click here to find your nearest Wickes store. You can check the balance of your Wickes Giftcard immediately online by clicking here and entering the details. Where can I buy a Wickes gift card? You can buy a Wickes gift card from any of their stores. Click here to find your nearest Wickes store. As the moment, it’s not possible to buy a Wickes giftcard online, however they have announced on their website that this function is ‘coming soon’ so we will of course update this page when this happens. Where can I spend my Wickes gift card? 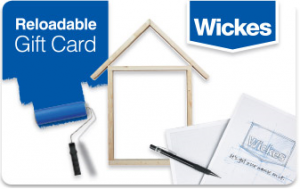 You can spend a Wickes gift card at any of their stores. Currently, it is not possible to use their giftcards to make purchases on the wickes.co.uk website, nor is it possible to use them to pay for goods you order over the telephone. Anything else I need to know about Wickes gift cards? The Wickes gift card will expire and any balance carried on the card will be lost if it is not used for a period of 24 months. “Use” includes making a purchase, topping up the card in-store or having a refund processed onto the card. It does not include making a balance enquiry. Be sure to use your Wickes gift card within the 24 month period otherwise you will lose your credit. You cannot spend the card on the wickes.co.uk website, it is only accepted in stores.